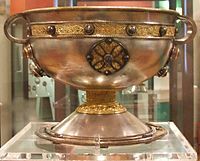 The Eóganachta (English: Eugenians) or Eoghanachta was an Irish dynasty centred around Cashel which dominated southern Ireland from the 7th to the 10th centuries, and following that, in a restricted form, the Kingdom of Desmond well into the 16th century. By tradition the dynasty was founded by Conall Corc but named after his ancestor Éogan, the firstborn son of the semi-mythological 3rd century king Ailill Aulom. In some later traditions of Thomond, Eógan had a younger brother, Cas, who is said to have originated the rival Dál gCais dynasty of Ireland, although this has been disproven. The smaller Dál gCais kingdom proved to have surprising military might, and displaced the increasingly beset Eóganachta, who were suffering also from attacks by the Vikings and the Uí Néill, on the Munster throne during the course of the 10th century. From this the Eóganachta and their allies would never fully recover, but they did continue, largely in the form of the MacCarthys and O'Sullivans, to assert their authority and rule large parts of Desmond for the next six centuries. They would badly rout the FitzGeralds at the Battle of Callann, halting the advance of the Normans into Desmond, and win back many territories briefly held by them. It should be noted that, as powerful as the Eóganachta were in Munster, they never provided Ireland with a High King. Serious challenges to the Uí Néill were however presented by Cathal mac Finguine and Feidlimid mac Cremthanin, who, although not recognized as high-kings or Kings of Tara, did control territories in their lifetimes the extent of which were as great as those of the Uí Néill. The kings of the Hill of Tara were sometimes called high-kings but were not recognized as kings of all Ireland in the historical period. The first undisputed Eóganacht king of Munster of note was the 7th century Faílbe Flann mac Áedo Duib, direct male line ancestor of the later MacCarthy kings. Despite this, the rule of the Eóganachta in Munster is widely regarded as gentle and more sophisticated in comparison with the other provincial dynasties of Ireland. Not only was Munster the wealthiest of the provinces, but the Eóganachta were willing to concede other previously powerful kingdoms whom they had politically marginalized, such as the Corcu Loígde, considerable status and freedom from tribute, based on their former status as rulers of the province. See Byrne 2001 for an extensive description of the kingdom. Their origins, possibly Gaulish, are very obscure. According to one of their own origin legends ( Laud 610, Summary), they may not have been originally Irish. The proto-Eóganachta, from the time of Mug Nuadat to the time of Crimthann mac Fidaig and Conall Corc, are sometimes referred to as the Deirgtine in early sources. The earliest evidence for the proto-Eóganachta, the Deirgthine or Deirgtine, is in the form of ogham inscriptions. They appear to have initially been subjects of the Dáirine, a warlike people with frequently mentioned connections to Ulster and who were possibly cousins of the Ulaid. The Dáirine were represented in historical times most clearly by the Corcu Loígde, over whom the Deirgtine finally achieved supremacy during the course of the 7th century, following the loss by the former of their centuries-long hold on the Kingdom of Osraige, apparently with some outside help from the Uí Néill. It would seem the Uí Fidgenti and Uí Liatháin, considered Eóganachta in later periods, also originated among the Dáirine. The Eóganachta achieved their status primarily through political and economic sophistication and not military conquest. Ireland was dominated by several hostile powers whom they were never in any position to challenge militarily on their own, in the initial centuries, but there also existed a number of subject tribes whom the Deirgtine successfully convinced to adopt them as their overlords. The effect was to separate the Dáirine, by now mainly the Corcu Loígde, from their cousin kingdoms and prominent subjects. The Eóganachta progressively surrounded themselves with favoured vassals such as the Múscraige, who would become the main source of their income as well as defense against the other kingdoms. The later famous Déisi Tuisceart, who would produce Brian Bóruma, were among these vassal peoples. The Déisi Muman of County Waterford may have shared Gaulish origins with the Eóganachta themselves. See Nia Segamain, Áine, Lugaid mac Con, Battle of Mag Mucrama, Mug Ruith, Leath Mogha, Senchas Fagbála Caisil, Mór Muman, Óengus Bolg, Aimend. Eóganachta dynastic surnames include MacCarthy, MacCarthy Reagh, O'Sullivan, O'Sullivan Beare, O'Mahony, O'Donoghue, O'Donoghue of the Glens, Moriarty, O'Keeffe, O'Callaghan, and Kirby, among many others, many of them of contested origin. MacAuliffe (or McAuliffe) is typically a MacCarthy sept. MacGillycuddy is an O'Sullivan (Mor) sept. O'Long is classed as Eóganacht (Raithlind). O'Driscoll is Corcu Loígde (Dáirine) but the family are related to the Eóganachta through early and late marriages and so qualify as natural kin. O'Leary can be either Corcu Loígde or Uí Fidgenti or Eóganacht depending on the sept. O'Carroll of Éile may or may not be distantly related to the Eóganachta. Scannell was also a sept of some significance. Out of the approximately 150 surviving Irish surnames of princely or comital origins, the Eóganachta and their allies account for approximately 30, or about one fifth. Unfortunately their pedigrees are often hopelessly disorganized and confused and so it is difficult or impossible to tell in many cases which people belong to which septs, or in fact if they even belong to the Eóganachta at all. There is also great evidence in the pedigrees and regnal lists of repeated modification, outright fabrication, and unceremonious deletion, at least for the early period (all concerned sources), with some criticisms quite severe, although this is also a problem with Connachta and Laigin material. A number of the figures below may be listed under the wrong septs. The quality of Eóganachta genealogical and historical writing greatly improves in the 2nd millennium under the MacCarthy overlords but some problems remain. Detail of a Cashel tomb. These three septs produced nearly all Kings of Cashel from the 5th to the 10th centuries. Some were strong, others were renowned bishops and scholars, and others were weak. The importance of the Cashel kingship was primarily ceremonial, and rulers were with the occasionl exception not militarily aggressive... although they continually strove for political dominance as far as they could with the province's wealth. Strong petty kingdoms regarded as "subject" would receive large payments called rath in return for their acknowledgment of the political supremacy of Cashel, and they would sometimes give hostages as well. 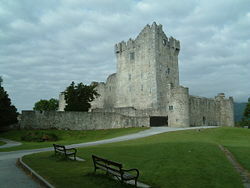 The most powerful petty kingdoms exchanged hostages with the King of Cashel, and though subject in some sense (by agreement), they were legally free and capable of terminating the contract. The Eóganacht Chaisil under the MacCarthys would later form the much more militarily capable but unfortunately undermanned Kingdom of Desmond. The O'Sullivans were the most powerful lords under them. The O'Keeffes of Eóganacht Glendamnach would later produce many great soldiers for Irish and Continental armies. The O'Callaghans were a smaller sept who have since distinguished themselves in recent times, while the MacAuliffes and MacGillycuddys are as stated simply septs of the MacCarthys and O'Sullivans. The O'Kirbys of Eóganacht Áine were unfortunately ruined by the Norman Invasion of Ireland. The "outer" Eóganachta dwelt to the west and south of the central dynasties. Though descended from Conall Corc and thus theoretically entitled to hold the kingship, in effect these dynasties were excluded from Cashel politics, a situation which may or may not have been based on geographical realities. Powerful kings could become de facto Kings of Munster, but in general the central dynasties refused to recognize them as such, and this resulted in particular antagonism betwee Cashel and Eóganacht Locha Léin, the power of which was eventually broken. Eóganacht Raithlind was not as aggressive and so survived under O'Mahony rule well into the 2nd millennium. The O'Donoghues, originally from Eóganacht Raithlind, would move in to become the new princes of Eóganacht Locha Léin, and are still represented among the Irish nobles today by the Lord of Glenflesk (see below). Oddly enough, the Eóganacht Raithlind, the Eóganacht Locha Léin, and the Uí Fidgenti-Liatháin (below), are all together referred to as the Three Eóganachta of Munster in the ancient story known as the Expulsion of the Déisi, which is strange in part because the first two were supposedly descended from Conall Corc and not Dáire Cerbba, but this grouping may be simply meant to illustrate that these were all free tribes in comparison with the rent-paying Déisi. The Eóganacht Locha Léin were themselves often viewed by the "inner circle" with surprisingly vicious hostility, and this somehow involved a connection to the Picts of Scotland . If these Kings of the Picts did in fact derive from a sept of the Eóganachta, then the Eóganacht Locha Léin, and thus the ancestors of the O'Moriartys and others, are the most obvious candidates. Not only were they at one point expansive as the powerful Kingdom of Iarmuman, but they were also frustrated by their exclusion and forced isolation by the inner circle. Glaringly, they were said to descend from a Pictish woman, and this was sometimes given as the reason for their isolation. The inner circle exhibited peculiar attitudes from time to time and so this could have been the real story. Eóganacht Maige Geirginn. The plain of Circinn is thought to be the area of Angus and the Mearns in Scotland . Sometimes also included are the Uí Fidgenti (O'Donovan, Ó Coileáin, O'Connell, others) and the related Uí Liatháin (Lyons, Gleeson, others), ancient allies of the Eóganachta who may have originally belonged to the Dáirine, although it is also possible they were earlier or peripheral branches of the descendants of Ailill Flann Bec, or of Ailill Aulomm, not involved in the innovative Cashel politics of the descendants of Conall Corc, actual founder of the Eóganachta dynasties. In this way, the children of Fidach, the early monarch Crimthand Mór mac Fidaig and his sister Mongfind, also belong to the peripheral Eóganachta. But only the descendants of Conall Corc, son of Luigdech or Lugaid, son of Ailill Flann Bec, could claim Cashel, whereas all three of these more distantly related aristocracies appear to descend from Dáire Cerbba and/or Maine Munchaín, so-called brother(s) of Lugaid. In any case, both the Uí Fidgenti and Uí Liatháin were apparently fading, for whatever reasons, while the Eóganachta were in their prime. They paid no obvious tribute but were little involved in the political scene after a period, the terms of the alliance being only that they were expected to support the Eóganachta militarily on "honour related" expeditions outside Munster or in the defence of it. The Uí Fidgenti did exchange hostages with the King of Cashel, just like the Eóganacht Raithlind and Eóganacht Locha Léin were honoured, and so they appear to have been viewed as kin from an early period, even if they may have been Dáirine to begin with or included very substantial elements. In the earliest genealogies, mostly found in Rawlinson B 502, they are in some way kin to the Eóganachta, even if only through marriage at first as suggested by some later interpreters. According to Rawlinson B 502, Dáire Cerbba was born in Brega, County Meath , but no explanation is given. This might mean his family were even later arrivals to Munster than the Eóganachta and help explain their lack of centralization and well known colonies in Britain . The Uí Fidgenti (NW) and Uí Liatháin (SE) were in opposing corners of Munster with the Eóganacht Áine and Eóganacht Glendamnach more or less in between, as well as the Fir Mag Fene. Brega bordered on the territory of the Laigin, and was originally a part of it. Against this is the fact that the Uí Fidgenti had their own capital at Dún Eochair in Munster, constructed by the Dáirine several centuries before the rise of Cashel, as described by Geoffrey Keating. See Byrne (2001), Todd (1867), Brian Bóruma, Mathgamain mac Cennétig, Cennétig mac Lorcáin, Kings of Munster, Kings of Desmond, Thomond, County Clare , Déisi. See FitzGerald, Battle of Callann, Earl of Desmond, Desmond Rebellions, Second Desmond Rebellion, Florence MacCarthy, Tudor reconquest of Ireland, Dónall Cam Ó Súilleabháin Béirre, Siege of Dunboy, Plantations of Ireland, Irish Confederate Wars, Donagh MacCarthy, Viscount Muskerry, Earl of Clancarty. For the 20th century, the long hidden Ó Coileáins of Uí Conaill Gabhra, once the most dominant sept of the Uí Fidgenti, produced the famous Michael Collins, or Mícheál Ó Coileáin. His sept were driven out of County Limerick in the 13th century by the FitzGeralds, but still regarded themselves as dispossessed aristocracy. The Ó Coileáins had joined their cousins the O'Donovans in County Cork , who themselves had been assisted by their friends the O'Mahonys. The MacCarthy Reaghs would soon follow to become the princes of the area, and later both they and the O'Mahonys would send septs to be accepted among the aristocracy in France . See also Counts of Toulouse. Of the four, only the O'Donovans, keeping a low profile, remained Gaelic lords after a time. Daniel "The Liberator" O'Connell belonged to a small sept of the Uí Fidgenti who found themselves in County Kerry. The scandal created by Terence Francis MacCarthy has left their futures uncertain. See Chief of the Name. O'Donovan, John (ed. and tr. ), Annala Rioghachta Eireann. Annals of the Kingdom of Ireland by the Four Masters, from the Earliest Period to the Year 1616. 7 vols. Royal Irish Academy. Dublin. 1848-51. 2nd edition, 1856. Sproule, David, "Origins of the Éoganachta", in Ériu 35 (1984): pp. 31-37.